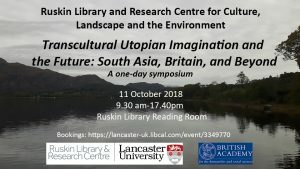 15.00-16.00 Presentations (10 minutes each) on ‘Lancaster Utopias’ by Monika Buscher, Nicola Spurling, and Lynne Pearce, focusing on transcultural and utopian dimensions of research and events undertaken in Lancaster in the past 10 years. Chair: Sandra Kemp. 16.30-17.15 Migration, Identity, and the Creative Now-here of Manchester. British South Asian writers Shamshad Khan and Qaisra Shahraz, in conversation with Barnita Bagchi and Lynne Pearce. Registration open, and is compulsory. Please email j dot m dot shepherd at lancaster dot ac dot uk.